Last weekend I had the time of my life; I was reunited with dear college friends whom I hadn’t seen in ages (and by ages, I mean 8 months, for when you are accustomed to seeing people ‘round the clock, ¾ of a year is an eternity!). Meanwhile, two very powerful men neared the end of the times of their lives. I’m referencing the deaths of two leaders of extremely different proportions and legacies who both deserve equal billing in the history books. One, the staunchly communist dictator of a land so far removed from my everyday world that his significance – while weighty for American-Korean families with relations behind the now de-militarized border -has little impact on the Western World. Yes, I know North Korea has much stockpiled in the way of nuclear weaponry and enough angst built up in it’s malcontent leaders to use it, but we are in no way living in fear of the nuclear holocaust Americans once experienced during the insufferable years of the Cold War. Vaclav was an extraordinary gentleman despite having lived a life replete with vices (his smoking habit likely shortened his life significantly (but then again, it’s Eastern Europe and I can tell you from first hand experience that very few people there do not enjoy a ciggie) and his second wife caused so much controversy the people nearly yanked Vaclav out of power (but then again, who doesn’t find the lyrics to Jimmy Buffet’s “Margaritaville” to be truthful: “I know it must be some woman’s fault!”)). In his hearts of hearts he was a freedom fighter like no other, proudly leading protestors during the 1989 Velvet Revolution in Wenceslaus Square. 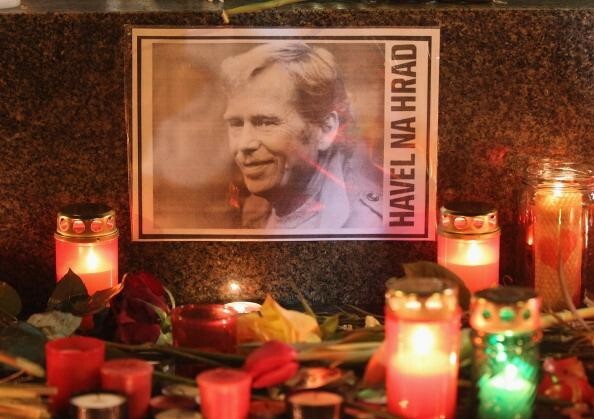 In the people of Prague’s hearts he will always and forever be a hero, as was evident by the outpouring of love and candles and tears and from thousands gathered in the significant square these past days. In the Czech Republic, today, Wednesday, through Friday has been declared a period of national mourning culminating in a funeral at St. Vitus (incidentally, the most breathtaking cathedral I’ve ever seen next to Gaudi’s Sagrada Familia). Now let’s talk about his global influence, for his hometown importance is clear. First of all, this revolution is aptly named as it removed the communists from power bloodlessly, led to the toppling of the Berlin Wall and the reunification of Europe. Anyone whose ever read a biopic on the men of the United States’ own revolutionary war knows that it was at a great cost to human life that we gained our freedom. Not so, in Prague, thanks to Vaclav. Just weeks after the revolution, Vaclav was named to power by the still communist party leaders, but leaders who despite their party affiliations were worlds removed from Josef Stalin’s Cult of Personality. After Czechoslovakia’s split into two nations, the people re-elected Vaclav. He is one of few, if not the only, man to ever be President of two different countries. He was president of both countries for a nearly 15 years. Vaclav was no ordinary leader, in fact he was the type of leader to whom in America we would never allow the chance. American journals publishing news of his death by calling him an “unlikely leader” proves this point. Locked away for his strong beliefs, he was a political playwright and a musician (who invited the Rolling Stones to Prague Castle and played the saxophone with President Clinton at a Jazz Club in Prague 1). His hero was Frank Zappa and his signature often concluded with the flourish of a small heart. Vaclav’s motto was “Truth and love will overcome lies and hatred.” Now if that’s not a mantra the whole world can adopt, I don’t know what is. Even in his retirement, well after the years of the “Era of Distrust” he spoke openly about failings in the current Czech government, calling it the “Era of Disgust”. Multiple times he was nominated for a Nobel Peace Prize (more deservedly so than Barack Obama, unproven winner) and continued to press for democracy from Darfur to Myanmar. An award he did win was the “Presidential Medal of Freedom”, the highest civilian award bestowed by George W. Bush. A man who passionately defends his principles and his freedom is a man worthy of press, commemoration, knowledge. It frightens me to know just how many people do not and will not ever recognize Vaclav’s significance in our everyday lives. Not one of the network news stations thought his passing or life notable enough to mention amongst the drat that is titled “newsworthy” at 6 or 10pm. National newspapers tucked his story into a right-side column. This sort of travesty has happened before. We all recall Michael Jackson’s sudden death in the summer of 2009. Farrah Faucet, and equally if not more significant human being not surrounded by constant controversy, passed that same weekend. It was days before stories of her life inched its way through the mania that was MJ’s death. If only dear Vaclav had held on to his corrupted liver for another few days, the ears and eyes upon which his stories would have settled would have been exponentially increased.